The project involves the deployment of a 30-tonne per day CO2 capture unit and ancillary equipment at Resolute's pulp mill in Saint-Felicien, Quebec and the commercial reuse of the captured CO2 by the adjacent Toundra Greenhouse complex. March 20, 2019 - CO2 Solutions Inc. has provided an update on its first commercial project with Fibrek General Partnership, a subsidiary of Resolute Forest Products and Serres Toundra Inc. The project involves the deployment of a 30-tonne per day (tpd) CO2 capture unit and ancillary equipment at Resolute's pulp mill in Saint-Felicien, Quebec and the commercial reuse of the captured CO2 by the adjacent Toundra Greenhouse complex. Toundra Greenhouse is a cucumber-growing complex in which Resolute owns a 49% joint-venture interest. 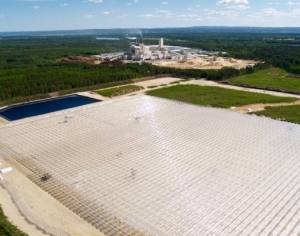 The greenhouse is situated on a 45-hectare piece of property donated to the project by Resolute and is located adjacent to Resolute's Saint-Felicien pulp mill. The pulp mill, in turn, supplies enough low temperature hot water to fulfill 25% of the greenhouse's heating requirements. CO2 Solutions said that the start of the commissioning of the CO2 capture unit officially took place on March 14, 2019. The start-up was preceded by the successful pre-operation verifications of each of the capture unit's systems, after which the unit was put into operation and the first tonnes of CO2 were captured. CO2 Solutions now expects to ramp up the overall capture rate to validate the unit's nominal capacity of 30 tonnes of CO2 per day. The construction of the Saint-Félicien CO2 capture unit was partly financed with investments from Sustainable Development Technology Canada (SDTC) and the Technoclimat program of the Quebec government as well as a loan from Canada Economic Development (CED). Once the Saint-Felicien capture unit reaches its nominal capacity of 30 tonnes of CO2 per day, a six-month demonstration period will begin, after which the commercial phase will begin and CO2 Solutions will generate revenues from the sale of the CO2 to Toundra Greenhouse. CO2 Solutions is a carbontech leader in the field of enzyme-enabled carbon capture and has been actively working to develop and commercialize the technology for stationary sources of carbon pollution. To learn more, visit: co2solutions.com.